Amazon: Buy a Crib, Get a Mattress For Free! Amazon just started running a new nursery promotion you might be interested in! For a limited time and while supplies last, purchase a DaVinci crib and get a mattress for free! Walmart is still running their “buy a crib, get a free mattress” promotion that includes Graco and Storkcraft cribs so you might want to do some comparison shopping. Note: Free product coupon will be delivered with your order. Free product coupon code is only valid between August 20 -September 3, 2013. Today at Kids Woot you can pick up a Levana LV-TW502 Safe N’ See Advanced 3.5-inch Digital Video Monitor for $89.99. It’s $119.99 at Amazon where it gets good ratings. Kids Woot pop up shops include Disney puzzles and (yikes!) costumes. Your entire Woot order ships for $5. 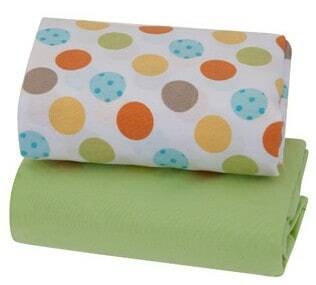 Garanimals Cotton Playard Sheets, Set of 2 just $5.98, Free Shipping Eligible! The Garanimals Cotton Playard Sheets, Set of 2 is on sale for $5.98 at Walmart.com right now. That’s 37% off the list price of $9.50! Shipping is FREE if you choose ship to store. Or you can get FREE shipping to home with $45+ order. Check out this awesome Banana Republic Coupon… you will save 50% off sale items! Just use the code BRTREAT at checkout! Plus, shipping is FREE on orders of $50 or more! Hurry, this code is only valid through 7/30/2013! Be sure to go through ShopAtHome.com to get up to 3% cash back! Wowzers! This likely won’t last long! Currently, BabiesRUs.com is offering up a 10 for $15 sale on select Gerber food items found here. Even better, the 3-packs of Gerber Graduates Puffs and Crunchies appear to be included in the sale – which means you can basically snag ten 3-packs for just $15! These also make for great baby shower add-on presents. So consider that when buying. That makes each container only $0.50! Crazy! Plus, opt for FREE in-store pickup at your local Babies R Us to save on shipping. If the 3-packs sell out, the Gerber Graduates Yogurt Melts also appear to be participating, so purchase 10 for just $15 – makes them just $1.50 each! Great price considering these normally retail for $2.99 each! * Note that this does seem a little too good to be true, so please keep in mind that orders may get canceled as I am not sure if this is a valid sale or an error on their end? 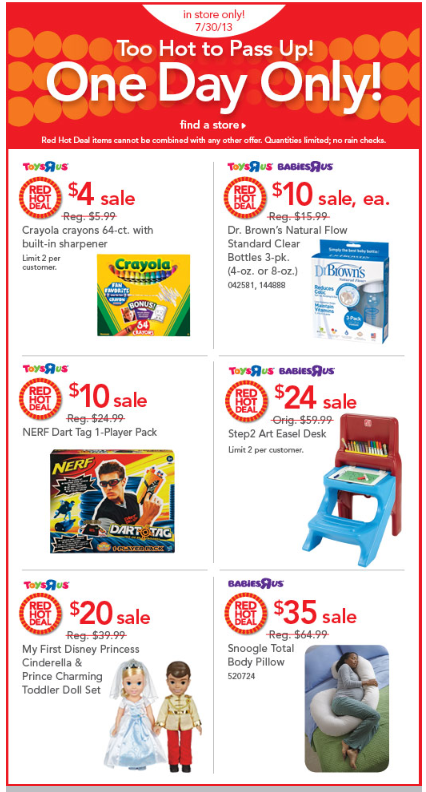 Today only, head on over to your local Toys R Us store to check out the One Day Only Sale! All of the sale items are limited to stock on hand and no rain checks will be issued so if you are interested, plan to get there early! Also note that sale items may vary by region so call your local store before you make a special trip. *as a price comparison, this same desk is selling for $50.70 at Amazon.